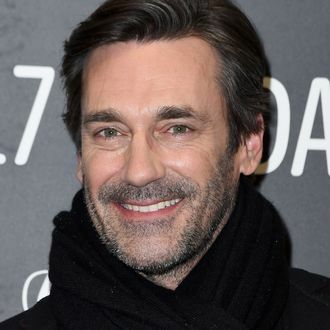 Jon Hamm seems like a really nice guy. To clarify: a really nice, tall, well-built guy who you probably wouldn’t want to piss off. And yet, President Donald Trump and disgraced Fox News host Bill O’Reilly thought it would be a cool, fun idea to have some kind of alpha-male standoff with Hamm during a Saturday Night Live after-party last year (for the SNL episode that Trump infamously hosted), and the whole thing just left our dear Hammy a bit confused. “He was with Bill O’Reilly,” he explained to the New York Times. “They’re both tall dudes. And I’m a tall dude. And they both do that tall-dude thing, which is try to intimidate you. And it doesn’t work on me. I’m like, ‘I’m as alpha as you. Let’s go. You’re not going to chest-bump me.’ It was a very weird night. It was the shortest I’ve ever stayed at an SNL after-party.” Think of all of the un-eaten canapés and iced beverages that were sacrificed due to this ordeal. At least Trump’s inner circle is taking the anecdote well.